In 2010, critically-acclaimed Interactive Fiction (IF) author Andrew Plotkin set up a Kickstarter project to fund a commercial text adventure, Hadean Lands. It received nearly four times its goal. Now after a four year wait, the game has finally been released. 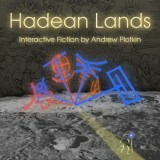 Hadean Lands is billed as a “classic text adventure,” where the entire game world and all the gameplay is entirely in text. You play as an apprentice alchemist “marooned in an alien, airless wasteland.” To leave, you'll need to repair your starship single-handedly, discovering new rituals and using your various alchemical skills to achieve this. Being a classic text adventure, this of course means puzzles. The game promises to be an immense puzzle-fest, and players can expect a substantial world to explore with what Plotkin describes as the “most complex puzzle structure” he's ever designed. To learn more or purchase Hadean Lands, check out the official website. It is available now for Windows, Mac, Linux, and also for iOS devices, each at only $4.99. Marooned in an alien, airless wasteland — your starship fractured — your crewmates missing.